If you’re searching for style and extreme performance, an Oris watch is a great place to look. You will find that the Oris team has assembled some of the finest Mechanical watches in the world. 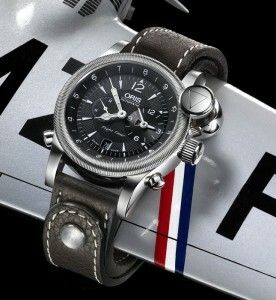 Their Pilot’s watches are just one of the amazing styles that have been engineered. The Oris Big Crown was one of the first pilot’s watches they came out with and it has been re-introduced in a limited edition version. The Big Crown was Oris’s tribute to the Hawker Hunter, one of the first jet aircraft in service. Realizing the significance of this watch to their aviation collection, Oris made the right choice bringing it back. The Big Crown is just that…huge. This massive watch measures 46mm, the largest in Oris’s aviation line. The case a multi-section stainless-steel, with grey PVD plating. This watch features a jet black dial matched with a rich brown leather strap and stainless-steel buckle. It is equipped with an Oris original, automatic winding small second hand. All of the indicator hands are crafted from luminous materials for easy reading, and of course, this watch is water-resistant to 328 ft. The Limited Edition Big Crown is presented in a specially made and comes with a Hunter jet ejection seat replica key ring. This is definitely a timepiece to treasure and a true collector’s item. With less that 2000 being produced, you’ll need to get yours, before it fly’s away.